Okay, okay…this took way too long to write! We’ve been really busy this month, but here it is—better late than never, right? Day 3: The Half Marathon. Things just got serious! For me, the 5k and 10k were not a big deal, more like warm-ups (and trust me, I don’t say that lightly—I know they are real distances and can be challenging, but for the Dopey, I had logged so many miles in training that they just felt like nothing). I knew today would be different, though, and I knew that my half marathon performance would dictate how I felt the next day. Another early morning of the same routine. 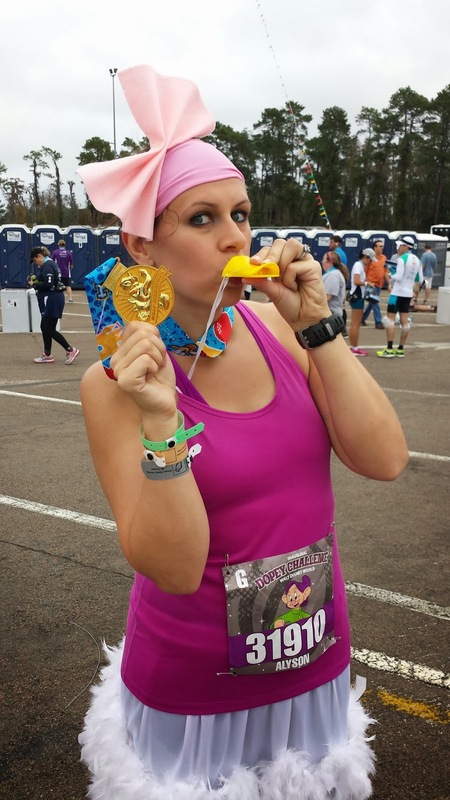 Today I paid homage to the official race ConDUCKtor, Donald, and dressed as his main squeeze: Daisy Duck. I didn’t go too crazy, though, knowing that I had a lot of miles to log. We opened the hotel room door, and the heat and humidity slapped me in the face. Crud. I hope this is not going to be as bad as last year. No need for a jacket this morning. We got in line for the buses, and I panicked a little. The line was huge! Last year, there were a few issues with the bus, so I was instantly nervous. Gotta give credit to them this time, though, because they had the buses lined up, ready to take all of us to the start—not much waiting at all. Having run this race before, I knew I was in for a long walk to the starting corrals. I didn’t stir around too long at the start; Bill took some pictures and wished me luck. It was time to get to the corrals. Warning here: this path is dark and has cones through the middle. I say this because I saw a woman trip over a cone and face-plant into the concrete. People were there to help her, and a few feet ahead they were already alerting race staff for help. I hope she was okay and it didn’t ruin her race experience. It just is another reminder to be alert at these races. They are very crowded and the early morning makes visibility low at some points. I arrived in my corral pretty early and was able to sit for a few minutes. 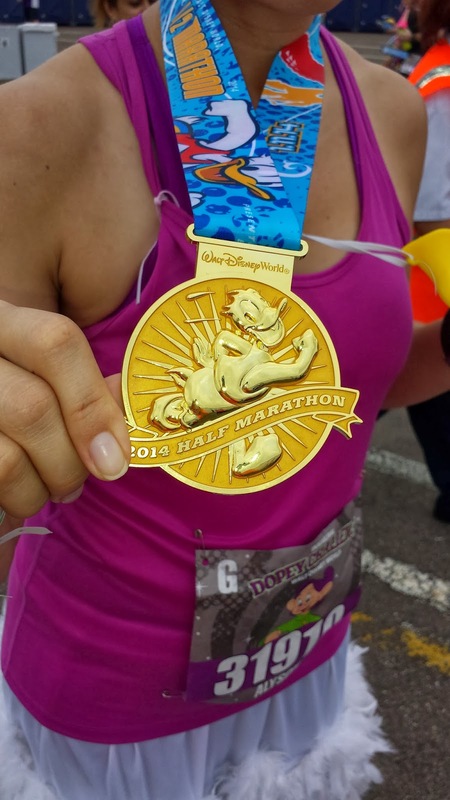 I whole-heartedly believe in getting as many minutes off your feet as possible when doing these back-to-back races. The start was buzzing, and unlike previous days, there were a mixed group of runners: Half Marathon participants, Goofy Challengers, and Dopeys, like me. The usual fanfare ensued: DJ, National Anthem, Fireworks, etc. To be honest, even being way back in G, we got off pretty quickly. There was about 3 minutes between each corral. Corral G was off, and I was committed to a 1:1 run/walk ratio. It’s tough! I’m usually not a run/walk/run-er, so to halt the urge to run straight out the gate was mentally challenging. I knew I needed to, though, because my success in the marathon was almost entirely dependent on my pacing today. My goal was 2:30. The first few miles were pretty dark and uneventful. I didn’t stop for pictures, but I do remember some long lines for Pirates. Around mile 4 you start to see many more people, hotels, and the buzz of a park approaching. Mile 5 loops you around to the entrance and you are finally running down Main Street USA. It really is a highlight—the castle looked beautiful all lit up and it was still dark enough to enjoy those lights. I love running this part in Disneyland, but I really, really love running this part in Walt Disney World. I’m a Cinderella girl—what can I say?!?! Quick trip around the park and you are running through the castle, back to front, for that awesome picture (that I never buy…). I scanned the crowd, slowed down, and really tried to look for my mom and hubby. Hope they saw me, because I never saw them (turns out they never made it in time). Back to the streets for a few more miles. It was hot and HUMID. 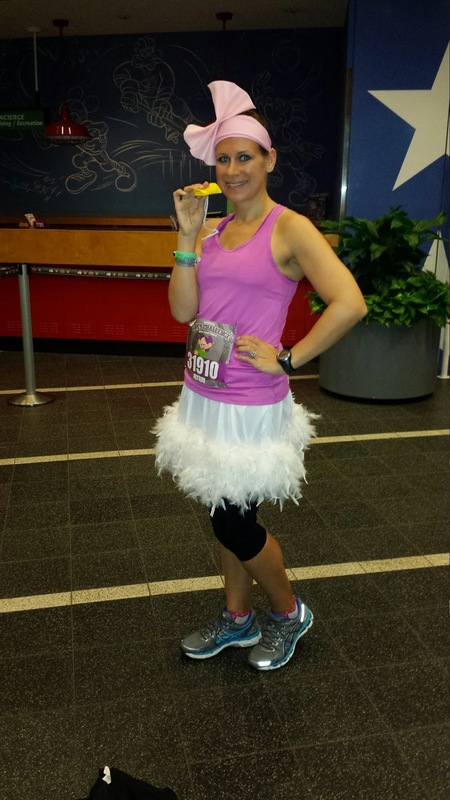 My Vegas running body was not used to this, but I kept to my race plan and hydrated often. To be honest, I don’t remember much about these miles. They actually went by pretty quickly. Soon we were ready for the finish—a short trip through Epcot around Spaceship Earth (there’s a quick U-Turn at the International Gateway) and the lovely sounds of the gospel choir. 13.1 was done! And my time: 2 hours, 31 minutes. I pretty much paced it perfectly! I gathered my medal, my food & drink, and headed to meet up with my family for a few quick pictures. I didn’t spend too much time at the finish line; I wanted to get into an ice bath and start my recovery. When we arrived back at the hotel, I quickly got into my ice bath with some hot coco. Perfect combination! I showered, and then put on my compression gear to wear in the parks. I felt pretty good, a bit tired, but pushed through the Animal Kingdom. Luckily, we planned the day well and were able to get back to the room for an early night. The time had arrived: I was actually getting ready for the last leg of this journey—the marathon!